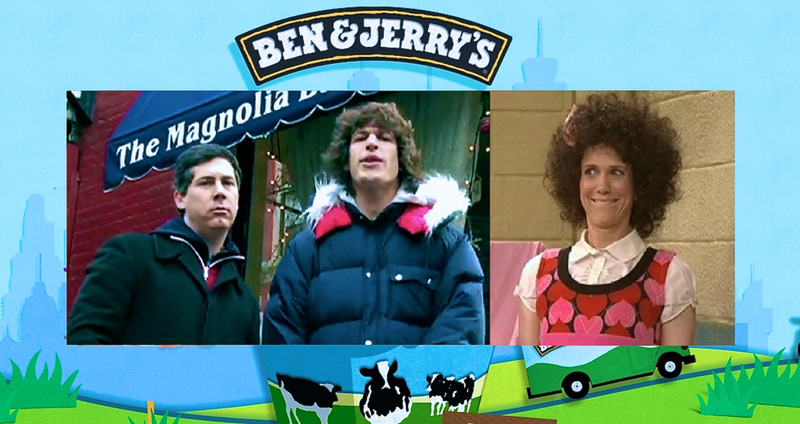 The Vermont based ice cream company — founded in 1978 by New Yorkers, Ben Cohen (PeekYou profile here), and Jerry Greenfield (PeekYou profile here) — have concocted two SNL themed confections to keep us cool, and full of glucose and lactose, during the program’s long, hot summer break. The first is Lazy Sunday, named after the 2005 SNL Digital Short, featuring Andy Samberg (PeekYou profile here) and Chris Parnell; and created by Samberg’s comedy troupe, The Lonely Island. It was really one of the first, if not the first, SNL clip to go hugely viral in the then still nascent YouTube era. In tribute to Sunday‘s talk of cupcakes, the flavor includes both chocolate and yellow cupcake pieces. The other is Gilly’s Catastrophic Crunch, named after one of the traditionally hilarious Kristen Wiig’s (PeekYou profile here) lesser creations. Consisting of chocolate and sweet cream ice cream, mixed with caramel clusters, fudge-covered almonds, and a marshmallow swirl, the flavor itself promises to be considerably less grating than its one-note namesake. All PeekYou profiles linked to above will take you to links aplenty, featuring jokes, snacks, and rumors of jokes and snacks. Below is a really low-res version of Lazy Sunday, and the proper HD version can be peeped at Hulu here.